I had to post a video up for this weeks challenge which I have done. I am not keen on watching back videos of myself but I did it. 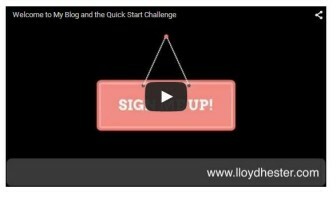 Great video Lloyd – I think the challenge is motivating us all to take action. Thanks Kevin but I would not call it great. It was done in one take a quick edit and up it went before I bottled it.. I will do better next time though which is a valuable lesson and a hurdle that I have crossed in my goal to build my own brand rather than standing in the shadows for so long. Well done in pushing yourself and getting the video done and up online! I love the look and feel of your blog too – some great posts. Keep up the great work Lloyd. Thank you very much Carol. I appreciate the feedback. It seems you are quite experienced in this realm. I’ll certainly want to spend some time here, as I see you have a number of topics that interest me. Good for you about Challenge Week 2. I’m still working on mine 🙂 To quote someone we all know, “I’ll be back.” All the best. Yes, I have been involved in internet marketing and websites for a long time and have a number of websites but suffer with a lot of the same issues that those of you knew to the internet do. So I believe I can do so much better so am hoping that the QSC can help me in all of these areas, apart from the alcoholism, as I am not quite ready to give up my red wine and Jägermeister bombs just yet. I am not too sure about the video, I think there is a lot that could make it better but it is a start. Congrats on your first video post. This challenge by far I think will be the most intimidating for the majority of us. Taking action is key. The next I believe is consistency. I still have to do mine. Best of luck. I agree that consistency is the toughest part which is why I took the QSC to give me momentum and a kick up the a**e that I needed to build my brand. Nice site. Glad to hear that everything is doing good. Let’s keep it up. Nice Lloyd. Very relaxed and clear communication. This was a tough challenge for me and probably for a good many others too. But now it is done and I for one have grown in confidence from it. Good luck with the future challenges. Yes, whilst I am a very social and confident man (although the wife thinks I am still a boy in my head and very childish. I just stick my tongue out and blow raspberries at her) speaking in front of the camera was quite hard. I have done a number of videos in the past for sales letters and product reviews but never, published any of them! So this was a first. Great Video Lloyd. Your blog looks already good… Congratulation! Thank you, I appreciate the complement. You did a fine job with your video here. You took action and completed the task. Congratulations. As well, you look very believable. I too am going down the Quick Start Challenge Path. I wish you much success! Our first video like our first at everything is the most important one as it marks a point from which we can only get better. You are right to be critical of the video not because there is anything dramatically wrong with it but rather because it’s only by being honest with ourselves and looking for ways to improve that we can actually get better. I agree Igor. And, also your confidence grows. I have not had a problem creating videos, in fact I own almost every video creation tool out there. Explaindio, easy sketch pro, screenflow, videocue, screensteps (MAC) adobe premier and camtasia, I have always resisted going in front of the camera. I dont know why but I will start to do more if it if needed I think. You are great in the Video! Very confident! Your website is also ready to start list buidling! I do need to add a giveaway to the offer but yes, the optins have been there for a while so I am a little ahead. I have a lot of commenting on other blogs to do so will spend some time catching up wtith that. Thank you Paul. I appreciate the feedback. Hi Lloyd … you’re developing a very nice site here. I do look forward to future posts. Thanks Richard, I appreciate the comments. Hi! Its Steven here from QSC. I agree to this, if you are willing to do something and if you have the courage to do it, you can do it. Good luck to your QSC journey!